Cycling wasn't the whole objective but served only as the medium. The objective was to seek challenge, to push myself and to explore the world. With that, I decided to cycle from John O'Groats to Land's End! A total of 1,000 miles in 9 days and I decided to do it alone, camping along the way. The devil-be-damned attitude took a lot of training, preparation and thought to get there. I had to look at available routes, look into getting to and from the start and end point, look at costs, review kit, set out a training schedule (and actually train!). Fortunately, I'm not the first to have done this, so I was also able to look at accounts of others to glean some useful information. 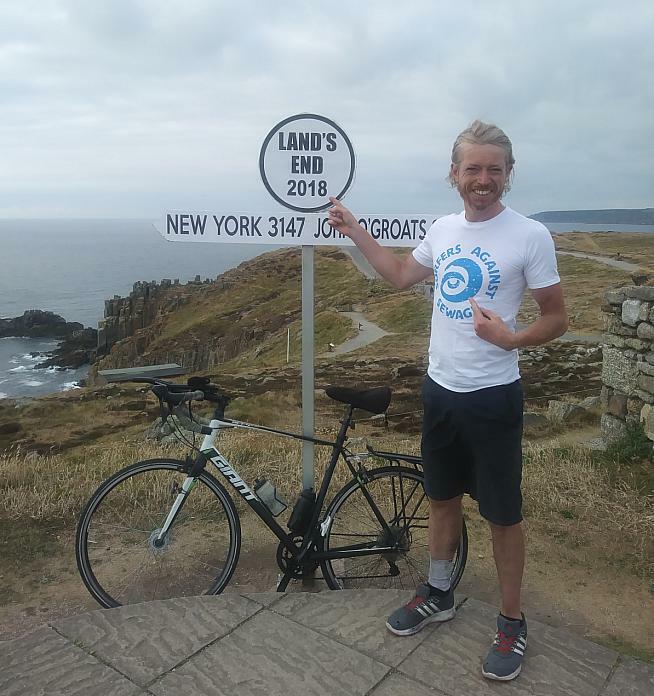 I started in John O'Groats on July 14th 2018 and finished 10 days later, on July 23rd in Land's End. Across those 10 days I faced almost all the elements the UK is known for: rain, wind, heat and sun. It was challenging, physically and mentally - grinding out those miles usually across a whole day, finding enough food and drink to keep topped up, and then getting up the next day to do it all over again. 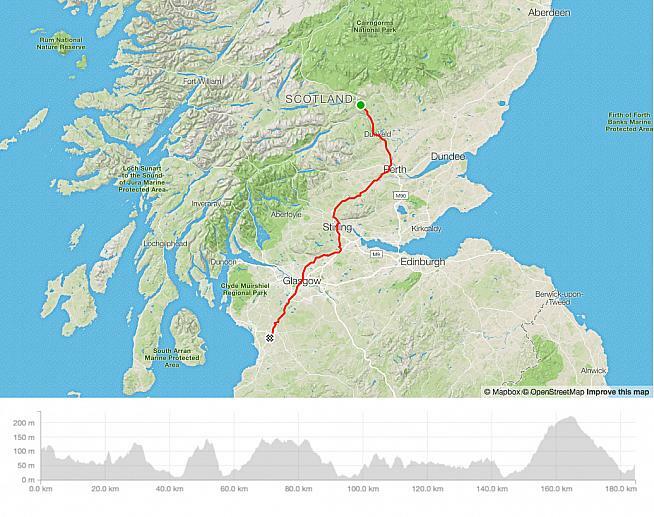 So, what's it like to cycle from one end of the UK to the other? Read on and find out about the places you'll see, the people you'll meet and the challenges you'll encounter. 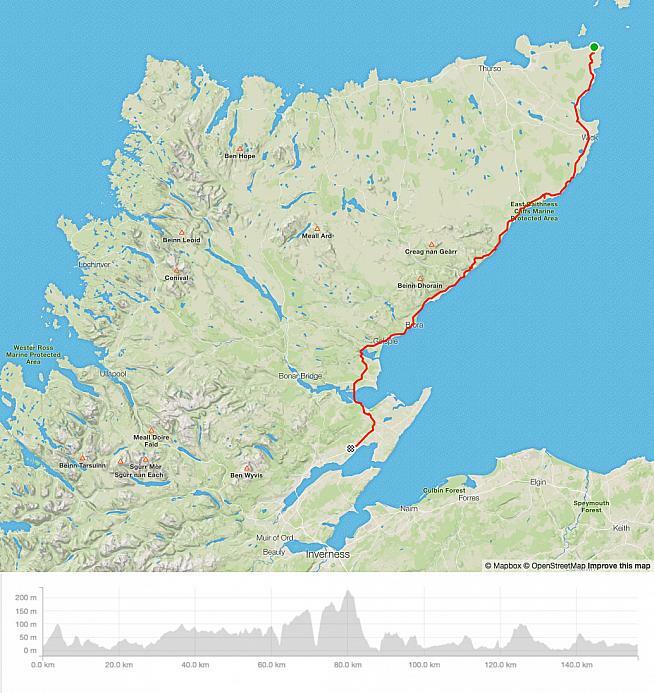 I wanted to do something a little different for my holidays this year, and decided on cycling from John O'Groats to Land's End (also known as JOGLE). I had looked into this in 2016, but had shelved the idea quite early on in the planning phase. I dug out those plans, reviewed them and got stuck back into the task of preparing for the challenge. The route I plotted went through Scotland, Northern Ireland, Ireland, Wales and England. Meandering this way and that, I would stop in with family in Ireland, ride the Wales In a Day sportive with my cycling club friends in Wales, and see a lot of the UK. 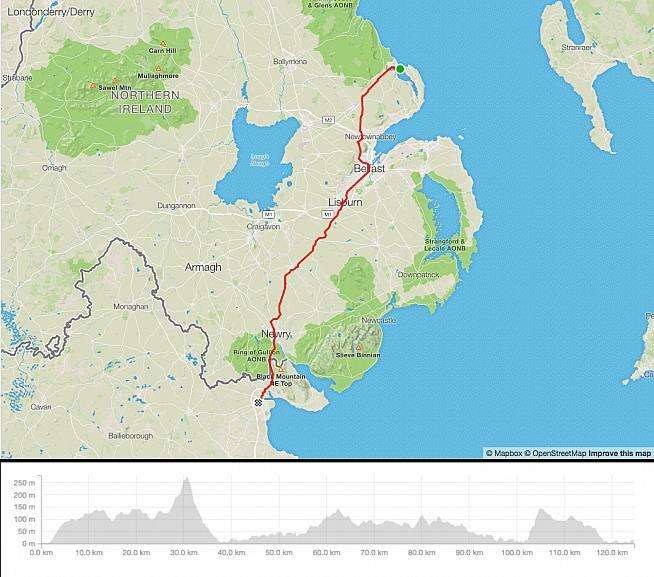 The total distance was 1,000 miles, and I gave myself 9 days to do it in (10 if you include the rest day in Ireland). Even cycling, costs can add up. I decided to camp along the way. Another benefit of camping is that if I felt good on the day, I could keep cycling past my original daily target and if I wasn't feeling as strong, I could stop and rest if needed. Planning started about 7 or 8 months before the actual ride, although the real planning and training started at the end of March. I needed to understand the physical and mental demands, work out a route, plan logistics (i.e. I'm based south of London - how do I get myself, bike and kit to the start point and home again? ), look at costs and any number of other things. I needed to plan what kit I'd need, buy new kit and test everything. I worked out a completely unreasonable training schedule of about 5,000 miles across 4-5 months in preparation for 1,000 miles... This was shelved fairly quickly. I did build up the miles though. I started off doing laps of my town after work when it was too dark to cycle on some roads safely. I went to France in early April to cycle Paris-Roubaix. From there, I started increasing my regular distance, averaging around 150 miles a week from the beginning of April to the end of May and then 200 miles a week across June. Becoming demotivated is easy when doing all those miles, so I found participating in events or planning a special trip really beneficial. 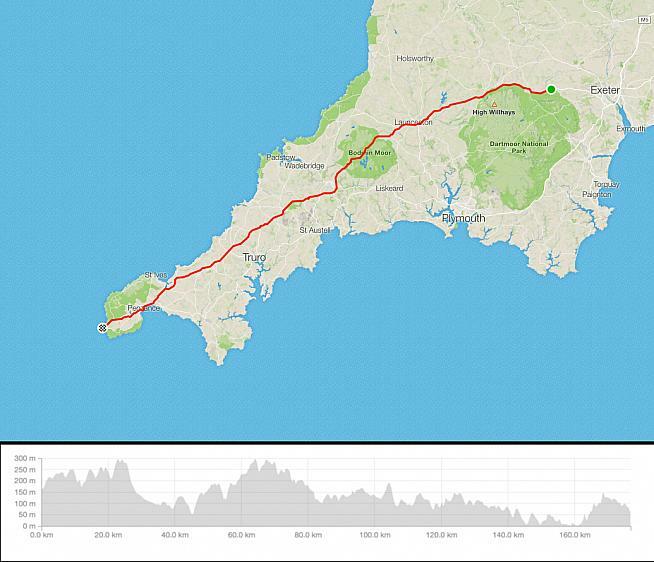 I aimed to cycle a sportive or other cycling event every 3-4 weeks. I cycled Paris-Roubaix (highly recommend), a local puncheur, a spontaneous 140 mile cycle back from Weymouth, and London to Brighton. I also cycled up to my aunt's one Saturday - it's not quite 100 miles, so when I got there I dropped off my bag and kept going until I hit 100 miles. I cycled back the next day. About three weeks before starting JOGLE I did a trial spin, cycling 250 miles through Kent with all the kit I intended to bring. You get wrapped up in the excitement of an event, swept along by the adrenaline of competition and this leaves you enthusiastic for cycling and training for weeks afterwards. Anyway, the day of travel arrived. I thought the same sense of 'what have I gotten myself into' would persist. But, as my friend John (who gave me a lift to Gatwick) can attest - I was excited! The day was here. I was flying north to start this epic challenge I had been planning and preparing for all year. I thought flying up to Inverness from Gatwick was going to be difficult. I had a lot of kit, I had a bike packed up in a cardboard box and was going through the second largest airport in the UK. I expected lots of questions and a lot of explaining. It was simple. Going through the check-in queue, the size of my box attracted questions from other holiday makers bored in line, and that was the extent of the questions there. Dropping off the box to oversize the biggest snag was I couldn't understand the question the chap kept asking me. Going through security my bag was searched as you're not supposed to have a spanner or tent pegs in your baggage... fortunately, the person who searched my bag was sympathetic and let me through with no troubles. Landing in Inverness, it was a beautiful day. After reassembling the bike I spun the 10 miles from the airport into the city centre to the train station. As I was going along, marvelling at the beauty around me and the road quality (road quality is always a make or break component of riding that all road cyclists look at) another cyclist overtook me. I caught up with him to pick his brain about what cycling in the north is like. He was great - he gave me some good insight and also sent me in the direction of a cycling café in Inverness called Velocity. I spun into the city centre and found Velocity for a quick pit stop and a well-deserved (I thought) piece of cake. I was having a bit of trouble with gear changes so their mechanic had a quick look over the bike and found that the service I had paid for before leaving had missed that the rear gear cable lever was seized. Also, the derailleur hanger was bent, not helping gear changes. I didn't have a tremendous amount of time with them so all I could do was either hope there was a cycle shop in Thurso or just hope for the best. Catching the train from Inverness to Thurso was a bit of a palaver - they can only take four cyclists at a time. When I went to buy my tickets the ticketing system was down so the train company had no idea how many cyclists were already booked in. It was a matter of wait and see. There was a trio waiting in the station for the same train to start their own JOGLE adventure. We passed the time chatting away as we waited to see what the future held. Fortunately, the train driver was on our side and made sure there was space on the train for us and our kit. I continued to amicably pass the time with the other cyclists - a retired dad, his son who looked early 20s and end-of-teens looking daughter. The scenery from the train window did not disappoint - absolutely stunning! Scotland is that long and that far north the sun didn't set until about 11:30. There was a long, beautiful sunset to view out the train's window as varied countryside whipped past. 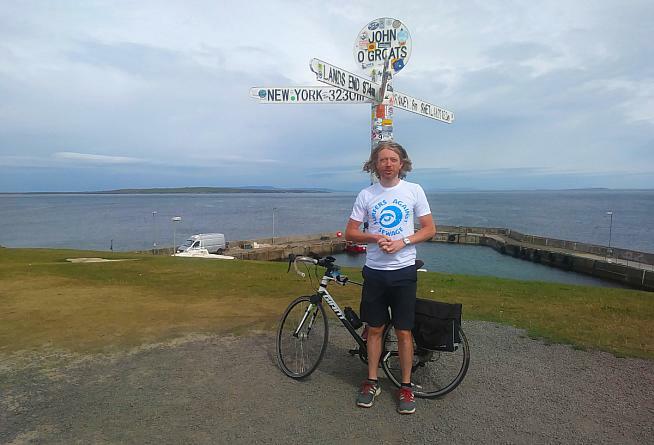 In Thurso, the family of cyclists went their way as they planned on starting the cycle the very next day and had to get up and still assemble their bikes and do final prep! We said our goodbyes not expecting to run into each other again. Fortunately, my bike wasn't too damaged from the flight up and, doubly fortunately, there was a bike repair in Thurso. The chap who ran the shop was fond of a good curse and directed a fair share of his frustrations onto whoever had serviced my bike before the trip. Afterwards, I popped out for a quick spin through the areas surrounding Thurso for a little explore. 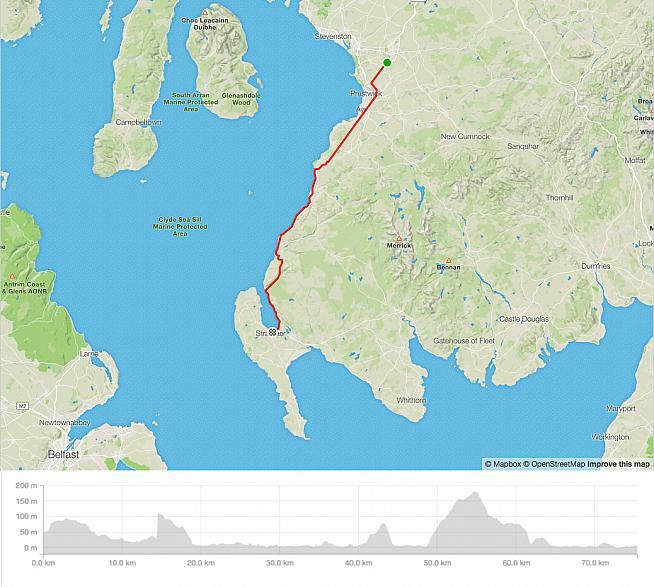 I rode west and north through Scrabster to the start (or end) of the A9 - which is significant, because on day three I ended my journey on the end (or start) of the A9, having cycled the full 273 miles of it! The bike was finally declared match-fit, my kit was packed and prepared. Here I was in Thurso only one day before the start of the big ride... Time for a pint (and food - lots of food). Morning came and I dawdled - to the point the hostel owner was sceptical I'd make it to Inverness that evening. I always faff and dawdle before a big spin (the do-I-really-have-to syndrome!). Eventually, I was off - the first leg of the JOGLE trip was to get to John O'Groats! It's a short 20 mile spin from Thurso and proved a deceiving warm up. The run is through some lovely scenery - a rugged beach and towering dunes outside of Castletown - and the road is reasonably flat, running east-west. Arriving at the crossroads in John O'Groats I made a left turn and headed the few hundred metres north to arrive at the very northernmost point of mainland UK. 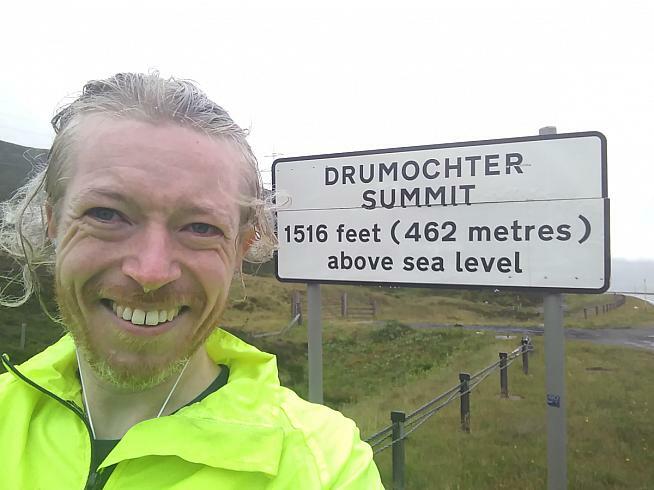 A quick change into my Surfers Against Sewage t-shirt for a selfie with the infamous sign for social media and it was time to officially start - leg two of the day from John O'Groats to somewhere south! The road out of John O'Groats is on a slight incline and an easy enough road, so when I crested the hill and the wind hit me I was a bit gutted. The rumours are true... Scotland is windy. Persistently windy. Like, days long wind! Oh, and only head or side winds. Tail winds have yet to be invented in Scotland. In any event, I was well fed, warm and naïve enough to be happy about what I'd just started! On I cycled. I had to stop a few miles out to fetch my rain jacket. And so started a pattern through the day of putting on and taking off the jacket as regular smatterings of rain fell. The first stop of the day was a pub in Lybster that served a mean cup of tea. A few of the regulars were whiling away their Saturday, not watching the World Cup - the match for third place between Belgium and England was being played that day. I was almost laughed out making a comment about it being a bit windy. They warned me of a fairly steep climb where the road hugs the cliff edge, twisting and plummeting close to sea level only to come into a steep climb back up the other side immediately and recommended a café at the foot of the descent. Dotted on either side of the road all the way down from John O'Groats were abandoned little buildings and homes in different stages of returning back to earth. As I was planning on camping under a tarp, these little buildings could have been perfect for a bit of overnight shelter. Also, some graffiti artist had tagged in several different spots, 'The world is flat, research it', which I found funny. Heeding the good words of the pub's patrons and publican I stopped at The River Bothy at the bottom of a beautiful, but sharp descent in Berriedale. The staff warmly greeted me with a cheery, 'You're wet'! Yes, I was - and cold, but still loving it. Cracking on along the A9 I covered another 20 miles before my final refuelling stop of the day: a nice restaurant, the Sutherland Inn, in Brora that overlooked the river and served a delicious tagliatelle. It was here I discovered the usefulness of hand dryers - they can also dry your clothes should you find yourself cycling in the rain for hours. A godsend! Although, while I was now dry, I still carried some odour which no amount of time under the hand dryer was going to blow away! Restored, dry and ready I hit the road again for a few more miles. The final leg of Stage 1's spin was just over 20 miles, taking in one final awesome sight across the wide, windy Dornach Firth. Stumbling on a supermarket in Tain I got some jelly sweets, chocolate and bananas, before finally stopping a few miles after. Just outside of Delny, I found a farmer's field filled with hay bales and a wood around the edges. The hay bales in the field were important because I knew the field wasn't being used for grazing animals who might surprise me halfway through the night poking their heads under the tarp! The grass in the corner looked trampled down like someone else had been using the spot. I set up the tarp, inflated the air mattress, rolled out the sleeping bag and stored everything else that would squeeze under the tarp. Fortunately, midges and mosquitos don't bother with me, so I didn't have to worry there and settled down with my book and sweets until I remembered the sun sets very late - it was past 11 pm and I was still up reading! I woke quite early on the second day with about 20 miles to cover before Inverness. My clothes or shoes hadn't quite dried overnight, so I pulled on my wet kit and broke camp. After a quick breakfast of uncooked tortellini I hit the road. It was a real struggle into Inverness and when I got to Velocity again I wasn't sure I'd made the best decision committing to do JOGLE! I had a delicious breakfast, a wee bit of a moan and off I went. Following the A9 I wanted to finish the day's cycle as close to Perth as possible. A long climb out of Inverness didn't do anything to help me rethink my holiday choices. I really should have recognised the symptoms - I've been there many times before. Really, it was just that I wasn't properly warmed up. On a lot of the longer solo rides I've done I usually don't enjoy some part of the first 50-70 miles and after that start loving the ride, the world and everyone it in - sometimes not wanting to finish after 100+ miles! For my little woes at the start of the day, I just needed to smash through the miles and let the enjoyment come. It rained intermittently across the morning, building to a generally wet day. On reflection though, while it's not comfortable to ride in the wet, I'd prefer to cover 100+ miles on a rainy day in the summer than under the glaring sun with no protection from clouds. You're in much less danger in the wet than you are when the thermometer starts to climb and the risks of dehydration and sun/ heat stroke start getting serious. Nevertheless, the wetness of the day soaked into my clothes, really affecting my skin - developing into quite bad chaffing between my legs. My shorts had a zip fly which rubbed against me also causing chaffing. It ended up that I'd stop every 25 miles, or roughly every one hour and forty minutes, to douse myself with more chamois cream and I started cycling with the fly down... which I occasionally forgot about when I stopped for a tea break at a café (definitely not a good look)! Coming into the Highlands there are robust, yellow gates either side of the road for closing it off across winter months when the snow and ice is too dangerous for vehicles to pass. Scotland's roads have a lot of laybys with numbers and very noticeable signs with a number to phone if help was needed. It was all this provision that drove home how unpredictable and wild the Scottish Highlands really are. The laybys are numbered so if in distress and needing help it's possible to identify which layby you're stuck in. However, no layby had an emergency phone... what if the cell tower was out or reception was poor due to the very storm that caused someone to pull over and phone for help? I'm sure there's a reason, but I couldn't figure it out. Remember that small family I met that were also cycling JOGLE? Well, I passed them. They had started a whole day sooner than I did, but just as I was getting into the Cairngorms, out of the corner of my eye I saw three cyclists come onto the road and thought they looked very much like the three from Thursday evening. I couldn't be sure though and it was raining, so I carried along. In the next village I stopped for a reviving cup of tea after wringing out my kit in the bathroom. On my way out the door to start riding again, the three cruised by and stopped themselves. We had a quick chat and I left them to enjoy their own tea. One thing that has long stumped me is the love for country music throughout the Scottish Highlands! Years ago when I was visiting I went to a pub and people of all ages were singing and dancing to country and early rock and roll songs. Again, cycling through the Highlands there'd regularly be signs for some country night or performer. One enterprising hotel had even organised some sort of tour that collected people from the south of Ireland, bring them by bus to the Scottish Highlands for a country music night! Moving on and into the heart of the beautiful Cairngorms it had moved from drizzling and slightly wet to a steady rain. Even still, I could not be dampened. You got a sense of the size of the park and the beauty it holds. Because I was wild camping I played a game with myself to keep an eye out for ideal camping spots. Initially, cycling north to south into the park there were so many perfect spots. But, climbing higher (I've just Wikipedia'd the Cairngorms and they're described as a mountain range!) the tree line faded to reveal exposed and barren scrubland not suitable for much at all, including finding cover from the rain. The day was one of the best, but between the rain, the chaffing and the climbing it was tough. I hit Drumochter late in the day - a place in the middle of nowhere with a big sign on the side of the road declaring it 1,516 feet above sea level. It was a long climb up the hill to get there and was significant enough a hill to warrant someone putting a sign there. All I know is that I was knackered. Camping options were still looking sparse and given that my partially wet clothes hadn't dried overnight the night before, I knew my squelchy shoes and dripping clothes had no chance of drying outside tonight. So, I pulled out my phone looking for B&Bs, hotels, and hostels and found something in Pitlochry. To add to the joy of this discovery it was basically all downhill for the rest of the 25 miles! I finished up the day having cycled another 115 miles. I checked into the hotel dreaming of a warm shower and kit-drying radiators! I rinsed the kit under the taps and hung everything on the radiator to dry. I couldn't figure out how to turn on the radiator (the room was already hot, but I wanted to blast my shoes dry) so asked an employee for help. When I opened the door to let them have a look at the radiator the heat in the room had already started drying my kit and, whoa, it stunk! I finished off the night devouring a pasta dish from the restaurant downstairs, catching up on the Tour de France and charging devices. I was up at 7am for the hotel's buffet breakfast. Help yourself breakfasts are the best for the touring cyclist - fill your boots at the table and take food away for later (don't forget, I was burning a minimum of 3,500-4,000 calories during each day's bike ride alone). Stage 3 started off promising though: a good breakfast, warm and dry kit, a good night's rest and the roads were drying up from the rain. Pulling out of Pitlochry I wanted to finish the day just south of Glasgow. But, before that there was still the southern part of the Cairngorms (and a slight descent) to enjoy. The Scottish midlands are fantastic - very touristy with a few universities. Towns are clean and interesting with lots to offer. It was about mid-morning that, for the first time in the entire ride, the sun broke through! I remember riding along one east-west road and looking over my right shoulder with a beautiful expanse of ancient hills stretching on and on all under a clear, blue sky. It was very satisfying to look back knowing that was a part of the cycle conquered. During the dry run (about 2-3 weeks before the actual ride) my Achilles started making complaints. It was too late by then to take any significant steps towards proper recovery. I took a couple days off the bike and only did shorter spins, which was rest enough. A quick Google of the problem also recommended ibuprofen to relieve the inflammation. Day three and ibuprofen wasn't doing the trick any longer and taking a break from cycling was out of the question. The inflammation increased through the day to the point that completing a revolution of the pedal was quite painful - as the pedal rotated around to where the right leg would push the bike along I would get shooting pains. Helping to forget about the pain in the ankle, I also started getting pains in the knee. This was maybe mile 40 or 50 and I still had about 65-75 miles to do... No way was I going to manage as I was. Fortunately, I was able to hobble along to the next town, Dunblane, and find a pharmacy for a top up on ibuprofen and get an ankle brace. Dunblane turned out a very nice little town and as it was coming onto the afternoon and I'd already done a few miles for the day I decided to take a break at one of the cafes on the high street. I sat outside with my book, had some tea and watched the world pass by. Eventually, it was time to go. Before setting off I had a look at my Achilles, which was swollen, bruised and sore to the touch. But, putting on the brace made a massive difference. The support caused the discomfort to disappear instantaneously! I could cycle no problems again. Back on the bike with no pain, the sun was shining, there was a little variability between more regular towns so something to look at - what wasn't there to love? Of course, Stirling is a historic town well known for its castle and university. The town is well maintained and would have been great to stop and look around. Cycling through Glasgow was interesting too. It's hard not to have preconceptions of the city, but there were some really beautiful, historic buildings and very helpful people. At some point in the day I lost the button keeping my shorts around my waist. When I get on the bike I generally stand to the left and throw my right leg over the saddle (it was the Achilles in my right leg that was complaining). As the discomfort developed through the day it became harder to throw my leg over, so maybe it somehow resulted in me flexing my hips more? I can't quite recall, but at some point I noticed during an attempt to get on the bike my shorts started to fall and when I looked, my button was gone and my fly was still down because of the chaffing... Fly was fastened after that! Just south of Glasgow and I hit a wall. There is a long climb out of Newton Mearns, a suburb to the south. The chaffing from the day before was flaring up again in the evening heat and I had no energy at this point in time. I pulled over to lean into my food reserves - a handful of trail mix was not going to suffice this time. I downed a tin of beans and a tin of tuna in no time along with handfuls of all the nuts and fruit in my kit bags. I hoped for the best, but it was a case of too little, too late. I shouldn't have waited so long to eat and now that I was hungry I was hitting the low energy reserves. Back on the bike I really struggled for a continuous output, but I needed to keep going to find a supermarket and get food. Everything in front of me started morphing into delicious looking food! There is a cracking cycling network in that part of the world with really wide, well maintained cycle lanes. Hats off to the planners for putting that in place. I managed to limp along for a bit and then, like Popeye, all the food kicked in and I had energy again! I hit Kilmarnock, still keen on finding a supermarket to satisfy the cravings. I found a Tesco and loaded up - about four bananas, a sugary drink, a bag of Doritos and a pack of Snickers (that's what I had been craving for about 20 miles!). The day was starting to wind down and it was going to be dark fairly soon, so with my food I needed to get a wiggle on and find a place to camp. Just south of Kilmarnock I found the perfect place and set up camp. Again another farmer's field with crops. I pitched the tarp in the south east corner at the top of a hill with views to Kilmarnock and beyond. I had a few Snickers and most of the Doritos while reading before calling it a night. I had covered another 115 miles and only had 60 miles to go the next day! I discovered during the night that I don't quite fit under the tarp, either my head or my feet pokes out. At some point in the night I was woken up by a dose of rain in the face! I managed to curl up under the tarp and get back to sleep. Stage 4: The bottom looks like the top! When I woke up to tackle Stage 4 all was good. The sun was out, rain was at bay and I had a hotel, bed, shower and two solid meals ahead to look forward to. I had another breakfast of uncooked tortellini before setting off. I grew up in Canada, where there's a famous coffee franchise called Tim Hortons. Tim Hortons have recently started opening shops through the UK. I say through the UK, they have a good number in and around Glasgow and one in Cardiff. Definitely not any in the South East where I live. 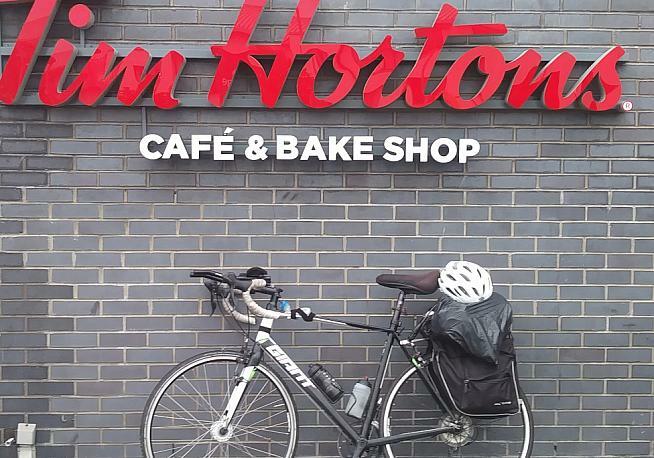 But, I knew I was cycling through places where there were Timmy's (that's what it's called if you ever find yourself in Canada). A quick Google and I found I was only 20 miles or so from a Timmy's in Ayr, which was along my route! I hit the pavement rolling! Between my camp spot south of Kilmarnock and Ayr all was good - no rain, of course a bit chilly, but you can't have it all. Anyway, I arrived in Ayr, found the Timmy's and ordered a large hot chocolate (it was huge!) and a doughnut (it was only normal sized) and tucked in for second breakfast. It was awesome. Tim Horton's was a treat for my brother and I when we were young, so all the nostalgia came back. After the wonderful trip down memory lane (and hopping into the bathroom to brush my teeth) I was back on the road. Because on each of the first three days I had cycled ahead of target I had a short day for stage 4 - only about 60 miles. Despite this, I found it quite tough going. It wasn't hilly, it didn't rain much. I just couldn't muster the enthusiasm (another case of not being warmed up yet). You could tell, despite the attempts to lure in tourists, this part of Scotland is a commuter belt carrying traffic between the ferry and Glasgow, with traffic only stopping when they need something. As I rolled along I started to think that there was little point in only doing 60 miles. If I could catch the afternoon's ferry I could keep cycling the other side and make the next day's cycle shorter. This woud give me more time with my family in Ireland and my rest day would start even sooner! I phoned the hotel to cancel the reservation and was told that I'd still have to pay the full amount because it was less than 24 hours before check-in. Upsides to both scenarios, staying in the hotel I could enjoy a shower and a bed that night! As the A77 came parallel to either the Firth of Clyde or the Atlantic, the road levelled out and transformed into a beautiful cycle with lovely ocean views to the right and beautiful landscapes to the left. The miles zoomed by. It wasn't all easy going however, there were a couple of challenging climbs, which really took it out of me. It was on this day that the first signs of wear and tear started also creeping into the bike. Up until now, the bike kept rolling without complaint. After close to 400 miles across the trip (and a few thousand before that now that I think about it) one of my bottle cages cracked, and I had the annoying rattle accompanying me. But, in the grand scheme of things, how lucky that this was the one and only thing to go wrong so far! The final descent into Cairnryan is a narrow road cloistered on either side by trees. As the road begins to descend the trees on the westerly part of the road begin to break as the hill drops down to the water and Cairnryan opens before your eyes. 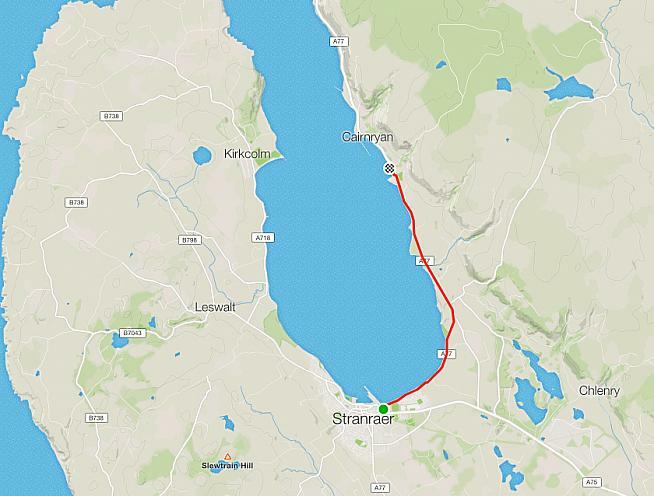 Carry on along the road for another 5 miles and you'll hit Stranraer, the old ferry terminal and where my hotel was. The Craignelder Hotel was on the main road in town and very easy to find. Avoiding collapsing when I got there I trudged inside to check in. Finding the manager, they checked me in, showed me the room and where I could store my bike out of the way. Through it all we chatted about my trip, where I started, when I left and how far I'd come that day. As the manager left me to sort myself out he called over his shoulder that he'd sort out lunch for me and let the girls know I was coming. I thought he meant that he'd ask them to stay on a little longer in case I didn't make it before they stopped serving lunch. After a shower, I popped down to the dining room and the girls told me the manager wanted to pay for my lunch! The rest of the day was spent catching up on the Tour, rinsing out and drying my kit and a bit of reading. The staff in the hotel were all very kind - one of the ladies even packed me up a small bag of fruit for the next day's cycle. Stage 5 was the day to say goodbye to a big section of the trip - I was going to board a ferry leaving Scotland (it was also only one day away from my rest day!). I hadn't booked the ferry ticket ahead, I just rocked up with the bike and bought my ticket. All very easy, although the staff on the desk and security checking vehicles were in some conflict over whether a cyclist should be considered a foot passenger or a vehicle. While the chap checked my kit for security he told me all about it - but it made no impact on me really and at the end he waved me through as I knew he would. The ferry ride across was uneventful. The ferry docked into Larne about 12:30 with 150 miles between Larne and the start of my rest day... Had I caught the earlier ferry it would have been much more feasible to cycle that distance. I set out from Larne following signs into Belfast. Between Larne and Belfast there is a massive climb, which seems to go on forever. It was long and steep. Equally as long and steep on the other side though, so flying into Belfast was brilliant fun! I couldn't leave Belfast without a bit of food, so once I knew I was heading in the right direction I stopped for a bit of lunch at Café Melrose, a great little spot with good food. Conveniently, as I was sitting down to the meal, my uncle phoned to work out arrangements for where I was staying that night. Had I been cycling along I would have missed his call entirely. Leaving Belfast I started realising just how much distance I still had to cover and how few hours were left in the day. I decided to cycle as far as would be safe and hop on the train the rest of the way. 'And a biscuit too, if you have one' was the answer before I could stop myself! All good things must come to an end though and after about 45 minutes it was time to get back on the road. I was soon back on the A1 barrelling towards the south and Dundalk. Although it was the hottest day of the trip to date and did have some tough climbs, I was disappointed to have to curtail the cycle. I was enjoying the spin from the point of rolling off the ferry in Larne, which doesn't always happen. The roads to Dundalk were smooth and quiet, with a gentle sunset and rolling hills. I pulled in about eight o'clock, hoping it'd be an easy and quick enough train into Dublin and out again heading west, being that Dublin is a capital city with a lot of commuters. The train stopped in Naas (where my family's from, and about 20 miles out of Dublin) around 23:30 - considerably later than I was hoping for. I had been in touch with my uncle when I knew I was running that late and worked out a solution so he wasn't staying up late. It was a great day in all. Only 80 miles covered on the bike, so 70 short of the target. But, I managed to touch down in three countries in one day! Even though it was late when I got in, I went out for a quick midnight stroll. When I got back to the house I settled into bed with a cuppa and caught up on the Tour de France before switching off the lights around 2:45. The much-anticipated rest day arrived and it was anything but... I woke up at 5:45 with no hope of getting back to sleep. Trying to be quiet, I made a cup of tea and read for a bit in bed. But was up again for a shower at about 7:30. Trying to be quiet proved difficult! The shower head was only propped up in the bracket and fell, smacking against the tiles with the sound echoing through the cavernous bathroom... so much for being a good house guest. After that disaster I just got dressed and headed out the door as quick as possible where any noise I made wouldn't disturb anyone. Turning right out of the house, I thought I'd walk around some of the haunts I can remember going to with friends as a child. I remember those walks taking at least a bit of time. Evidently time has changed that. It seemed that only a few strides down the road and I was at the old football pitch. I ended up walking around town and thoroughly enjoyed the morning. It was a beautiful day and some of the quieter roads I remember from childhood have now been pedestrianised. I had a great walk along the canal, into and through town all in the knowledge that I wouldn't be cycling much today. Throughout the day, it was a revolving cast of aunts, uncles and cousins. It's always great to go back to Ireland and see everyone. An aunt who's retired had come to town for the day so we had lunch with a few others and spent the afternoon walking through/around/under/over town (we got lost and walked everywhere!). Eventually I made it back to the house long enough to change and head back out the door to meet an uncle at the pub. Running out the door, I took a call from a community-run radio station that I had been on before starting JOGLE to talk about my trip. They wanted to do an 'as it was happening' follow up. As it happens, my next door neighbour, and very nice chap, is also a DJ there. We arranged a time and date to catch up on air, which was during my walk to the pub. I met my uncle for a well-deserved pint of Guinness. We had a good catch up, but the day and the days before were catching up with me and I was almost falling asleep in my seat! I ended the day completely crashing around 23:30 after walking only maybe 20 miles! Stage 6 and I had a lie in... was up at about 9! I pootled about, finally hitting the road for 11:00. Before properly getting on the road, I popped over to a Halfords that was along the way and got a new bottle cage to replace the broken one. 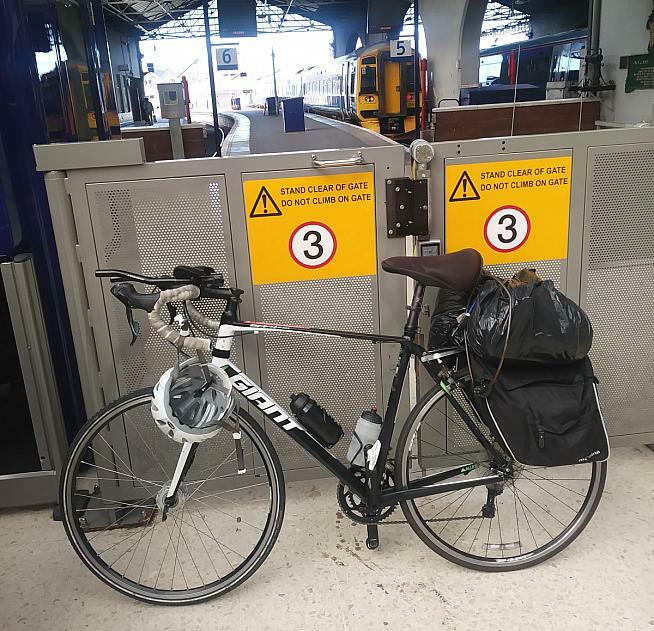 Armed with a new cage, I cycled across to the train station, which wasn't arriving for another hour. Making full use of the time I had a Dominos for lunch and got Kimberley and Coconut Cream biscuits. That is one of the awesome things about long distance cycling - any and all amount of junk food can be consumed without an iota of guilt! Waiting on the platform I crushed the pizza and replaced the bottle cage. Sorted for the future! From Heuston station, it was a simple cycle following the River Liffey through historic Dublin. Travelling about early afternoon and the area was buzzing with people and traffic. Between the energy on the streets and the beautiful buildings it was a great few miles. Much like the ferry from Scotland across to Larne, the ferry from Ireland to Wales was easy and uneventful, which meant I had plenty of time for multiple cups of tea, crushed one of the packs of biscuits (I mean, it was extra weight to have to carry around, right?) and have a nap... if that's not efficiency! 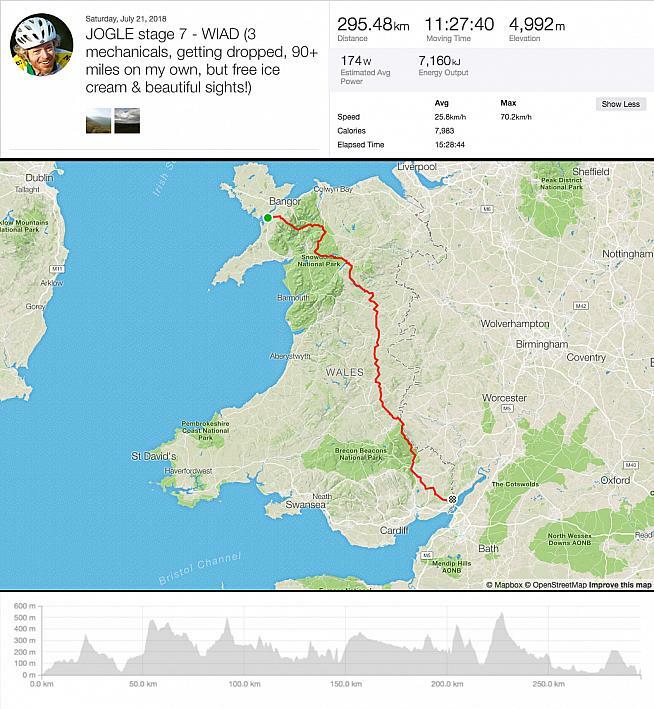 Stage 6 was really a commuting day - getting from Dublin across to Caernafon in north Wales to be at the start line for a cross-Wales cycle the next day. 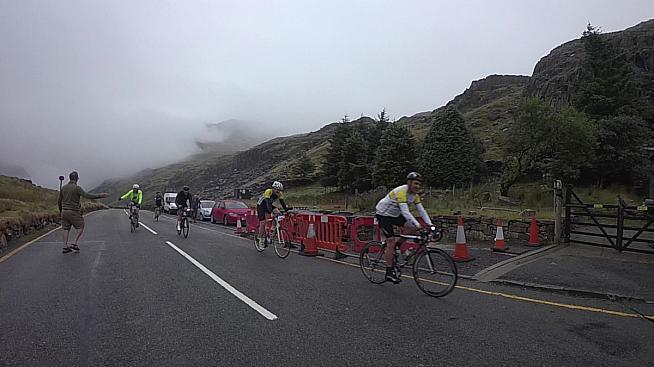 I was joining up with some of the boys from my local cycling club to do the Wales In A Day (WIAD) sportive together. The ferry pulled in behind schedule to a wet and grey Holyhead. The boys I was meeting up with called to see if I needed collecting. I didn't have the time to cover all the distance to the hostel, so settled on cycling as far along the road until they met me coming the opposite direction. I covered a whole 10 miles. My friends thought the misty rain was rubbish weather to cycle in, but compared to Scotland it wasn't bad at all! Meeting up with a load of other cyclists, it was all chat about the trip so far. It was in talking to everyone that I realised, with some sadness, I only had three days left JOGLE'ing. At that moment I wished I had planned a longer cycle (and only that moment...). We made it to the hostel, had a team meeting on what time we'd be up, where everyone was supposed to be and all of that fun stuff. Then everyone sorted their kit for sleeping that night and for the next day's cycle. It was off to bed then for about 11:00. The day of the event we were up for 3 am, assembled for 4:00 and out the door for 4:30. There was still a bit of wetness on the ground and a bit of a drizzle. Parking up in Caernarfon was awesome though. We assembled bikes, did final checks and then climbed the steep, ancient steps into the heart of Caernarfon castle to start the epic 185 mile cycle. The best event start I've ever experienced! Forming up and the sensible plan was to only push 200 watts average across the day to conserve energy and make sure the doors stayed firmly on. No one wanted to hit it too hard and run out of steam at any point in the day's long ride. From the very beginning we were treated to treacherous climbs, but in the same breath incredible scenery. Even with the morning fog rising we could tell the valleys of North Wales were beautiful and it was a treat to cycle through them. Everyone was in a great mood and we were setting down a fairly reasonable pace. Personally, it was great not to be pulling all the weight that I had been from John O'Groats (I had taken off my kit bags and left my several tins of tuna and beans, dried food, clothes, tools, tarp, sleeping bag and mattress in a team van for the day). The high spirits continued as we met our support crew cheering us on at the top of a steep pass. A quick descent and we were gaining confidence with the roads - they may have been a bit wet, but we could still go over them safely enough. In hindsight, maybe I should have heeded advice and ridden on wider tyres... WIAD was the day that my rear tyre/wheel started to give out. I had one puncture... then a second puncture... then discovered a hole in the wall of my tyre, which spelled the end of that tyre. But, not before one more thing could go wrong with it! The metal bead which runs around the outside of the tyre and gives it more stability split from the rubber. When you squeeze the brakes, the friction heats the wheel rim, also heating the rubber tyre and the air contained in the rubber tube. As we all learned, the molecules of a hot substance move faster than cooler ones, causing expansion. The rubber tube did an admirable job containing the hot air, but the split tyre did not do an admirable job of containing the expanding rubber tube! I quickly had a tumorous protrusion from my rear tyre big enough to rub against the bike frame! The lads had phoned our support crew and went on their way. I was collected and brought four miles along to Newtown to swap out tyres. Across the day our full group of 18 cyclists had broken into three smaller groups - fast, medium and slow. The slow boys still needed to come through Newtown, so I waited to join up with them. Unfortunately, it turned out they were quite slow and they said they didn't expect to be finished until 9:00 that night (turned out, they didn't finish until about 11:00), but 9:00 was well past my target time and was cutting into enjoying a beer. I left them on a really steep climb out of Newtown and settled into doing the remaining 90 miles on my own with the goal of trying to catch the lads ahead of me. By this point in time the sun had broken through and there were some really fantastic landscapes. Of course, we all suffered in the heat - one climb kicked up to 35% gradient with the sun's heat absolutely baking us as we climbed that monstrosity. There were a couple of steep, twisty and windy hills - but, by far and away, one of the best was Gospel Pass (Wales' highest road pass). An absolute paradise to behold (after gasping and wheezing your way up mind you!). It's high enough to give a really wide, panoramic view and on a clear day, like the one during WIAD, it's possible to see for miles. A lovely chap running the ice cream van at the top really did me a favour. I only had credit card with me and no cash, but thought I'd ask the obvious question anyway, 'Do you take card?' Of course, a van up a hill, in the middle of nowhere isn't going to, so I thought I was out of luck. But, the chap asked what I wanted nevertheless and generously handed over a Magnum. When I asked if he had a tap I could fill my water bottles, he fished out a bottle of water straight from the fridge and gave that to me too. Such a nice, generous gesture. I sat on the plateau marvelling at the beauty and enjoyed that Magnum! Hopping back on the bike, there was a final small hill before fully cresting Gospel Pass. As I cycled over, I had to slow (not that I was going fast) for wild ponies running across the road - so idyllic. Then came the fun as I whizzed past a sign, 'Steep hills for next 11 miles'! Just the thing that was needed after that climb! Someone, somewhere, though, thought that Gospel Pass was perfect for turning into an official cycling route and it is part of the National Cycle Network. If you're ever looking to make a fast buck and are mechanically minded, set up a mechanic's truck on some of those hills. I'm sure even the most experienced driver blows their transmissions trying to drive those hills! The feed stops though. They were awesome! Each and every one of them. Hot and cold food. The first had a delicious soup that really helped revive the spirits after the damp and chill of the morning mist. Another of them had very moreish cookies. One of the volunteers even pointed out tinfoil to wrap some up for the back pocket... I was still munching on those cookies the next morning - yeah, I took that many. The last feed stop had individual-sized oven cooked pizzas! After Gospel Pass there was about 20 miles or so to the finale in Chepstow, with most of it being flat. Cruising through some beautiful little villages on the TT bars was great. One final long, slow drag into Chepstow which curved around gave fantastic views towards the north. The end of WIAD was a bit confusing - cycling through Chepstow, passing signs 'Welcome to England'.... Where and when is this going to end?! Fortunately, end it did. Passing through the finish blocks the team bus and support team were there. After all the difficulties of the day with the bike and cycling the last half on my own I only finished about 30 minutes later than the fast and medium paced groups! By that point in time, most of the lads had already showered and were finalising plans on where to go in town for a celebratory meal and a few pints. On they went, and off I went to the showers and my own recovery. As the sun set, looking to the south there was a beautiful view of the Severn Bridge all lit up. Fortunately, there were no major incidents with our crew - just the four punctures, a shredded tyre, and one of our drivers accidently dinged another car. Once showered, I popped into town to meet up with the lads and join the celebrations. Of course, everyone was in a great mood. We bumbled along pub to pub until there were no more options and about 12:30 in the morning we got kicked out of the last remaining pub as they were shutting... thankfully. A few were already falling asleep in their chairs by then and even more (including myself) on the bus back to the hostel. The hostel turned out to be lovely in the morning - but we had been told we wouldn't be able to get the bus down the hill to it that night, so we would have to walk. 20 minutes later after descending this long, steep driveway we arrived at our lodgings for the night. Some of the poor chaps had brought all their bags from the bus, and hauling all that weight through the dark they started questioning if we weren't walking back to Caernarfon where we started that morning! We all managed to get to bed about 2 that morning. An absolutely cracker of a day greeted us the next morning. Looking to the south from the hostel's window the ground fell away to the bottom of a lush valley with small hills topped with trees. The sun was bright and already starting to feel toasty - there were warnings today was going to be the start of another heat wave. Slowly everyone began to wake and make their way downstairs for breakfast. The morning was uneventful with most picking up from where they left off the night before chatting about the ride, the evening and pains and cramps they were feeling now that it was over. I decided to hitch a lift with the chaps to Gloucester, directly east, and start the day's cycle from there. Much better than trying to figure out how to get out of the very remote place we stayed in and back on route. It meant though waiting for everyone to finish breakfast, get packed and haul their kit back up the massive driveway - being able to see it in the cold light of day didn't make it any shorter, probably the opposite! The banter continued on packing up the van and on to Gloucester. I knew it was going to be a tough day - I didn't need to be told that. 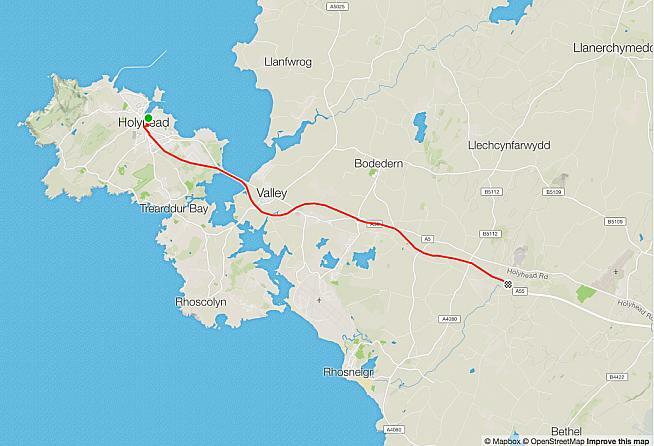 I wanted to cycle half the distance from Gloucester to Land's End, which Google maps told me was 260 miles. So I wanted to cover at least 130 miles. But, it was already 11:30 and it was hot. Pulling off my bike from the van, one of the chaps who'd cycled Land's End to John O'Groats (i.e. the easy way!) through Deloitte's Ride Across Britain (even easier now) was asking the plan and when I wanted to finish. After that very encouraging pep talk the lads left me standing there in the forecourt of some petrol station in Gloucester with all my kit around me under the baking sun with 130 miles to cycle. I felt like orphan Annie - all my friends drove off taking the party with them, while I stayed behind and all the colour from the scene sapped away to black and white. Not a high! Despite everything, I pulled back on my cycling kit, put the panniers back on the bike, filled my water bottles in the petrol station's loos and set off after double checking with the attendant on direction to go. Off again on the second last day of this great adventure! I couldn't shake the feeling of, 'What did I sign up to here?' I'd only slept maybe four hours the Friday night and another four Saturday night after cycling 185 miles through the day, not including the days of cycling before that. I was tired, but I wasn't giving myself the benefit of the doubt and didn't consider tiredness. I just suffered and plodded along, really resenting each pedal stroke. Before starting JOGLE, I had tentatively arranged to meet up with a friend who lives in Bristol. He'd told me he was only free during the morning. But, I didn't get into Bristol until about 2 in the afternoon, way past when he was free - and I wasn't in a frame of mind to be good company anyway! From starting in Gloucester, cycling the 30 miles to Bristol and going through the city I drank the original two water bottles I'd filled up and had to stop twice more in Bristol to refill again! I stopped to double check I was heading in the right direction through the city. Out of sheer hope the distance had somehow drastically shrunk I Googled Bristol to Land's End which came in at 230 miles. In utter despair I checked Bristol to Burgess Hill (where I live) and it was only 112 miles - much more possible to cycle in a day. Plus, there was a bed and a shower and I wouldn't have to get back on the bike the next day. I was close. That was almost the end of the great JOGLE adventure for me - John O'Groats to Burgess Hill instead. But, sheer stubbornness pushed me on and I climbed out of Bristol, past the airport heading south. Somewhere I pulled in to a layby that had a wide patch of grass covered in the shade by tall trees hanging over from the farmer's fields just the other side. Climbing off the bike I just wanted to sit and take a rest. I crashed completely. Out like a light and woke up an hour later feeling great. It was about 5 pm so some of the heat of the afternoon was fading, I was feeling energised and knew I'd make it. I had a few bites out of my saddle bags and took off again... a whole half mile until I came to a big M&S attached to a petrol station. By this point in time I had thought if a heatwave was coming I'd just try and cycle through the night and crush as much distance through the cool night as I could so that I wouldn't be stuck out like a pig on a spit entirely exposed to the heat. With that idea, I needed a refill on food - the good stuff. More tins of tuna and beans and Babybels and a sugary drink. Wandering around the supermarket there was also a Subway. A foot long sandwich seemed the perfect idea to carry me through the night's cycle. I heard another chap in line order a cup of tea, I didn't know Subway sells tea. Life was getting better by the second! I sat with heaps of food in the forecourt munching on odds and ends, drinking the tea and sugary drink and then was off again. Away the miles fell throughout the late afternoon and early evening - all woes from earlier that day vanished. Coming into Bridgwater I stopped off in a petrol station for a can of Coke, a top up of the water bottles and, as it turns out, a very helpful chat with the person behind the desk. She told me the latest on the developing heatwave, gave me advice about the roads - when they're busy and when was best to cycle. On my way I went after thanking her - a thoughtful Scottish woman working in a service station in Bridgwater! There's a lovely little park overlooking the river in Bridgwater, which is where I stopped off to enjoy half of the sub from Subway and the can of Coke and top up on the chaffing cream - the 180 odd miles from the day before and the heat of Stage 8 really caused a flare up! After a making a wrong turn I was back on the A38 heading south towards Taunton. It was around this time the bike started to revolt against the distance and all the weight it had to carry. Cycling down the road I noticed a musical clink and ping over my headphones that seemed to follow me - that's coming from the bike. Knowing that all too familiar sound I pulled over and hopped off. One of the spokes in the rear wheel had broken. One broken spoke usually doesn't make too much of an impact - I've done a few cycles, broken a spoke halfway through and carried on with the ride to have the wheel repaired later. So, when I pulled the spoke free I wasn't too fussed. Spinning on, I was still happy to be on the road and cycling even though it was passing 10:00 and the sun was setting. Sunday night in the south west of England - the roads are pretty quiet. I had a cheap light strapped to my helmet. When I noticed a car's headlights coming up on me from behind I'd turn on the light to let them know I was there and move over to the side of the road. Otherwise, it was a clear night with good illumination from the moon, good roads and not at all cold. Plus, I couldn't see my odometer - the miles just dropped away. The next thing I knew I was in turtle vs another turtle race holding up a municipal bus that kept popping up in the little villages leading to Exeter. Eventually the bus got around me and the excitement was over again, but I was in Exeter by then. It looks a nice place at 12:00 o'clock at night. Still heading along the A38 I found a service station for another top up on sweets, chocolate and a Coke. I still felt energised - mentally and physically. So, I hopped back on the bike and carried on... down the wrong road... again. Not for too long though, and I was soon back on the right road heading west along the A30. The A30 is a busy road. Even past midnight on an early Monday morning. It's a good time for big lorries to commute and I was having big lorries blowing past me at high speed pretty frequently. I tried ignoring it - it is a bit intimidating - and kept up with my goal in mind. I was still imagining cycling through the night, rolling into Land's End as the sun rose over the sea. The clock ticked on and the temperature started to cool. I had this weird phenomenon where I was still sweating but was also starting to feel cold. Not being able to see my odometer or any change in scenery I quickly lost the zeal to cycle all night. Losing the zeal can also be translated into I had had enough. It was too dark and I was too tired to care about finding a pastoral field where I could retire to peace and quiet. I found a small layby, it wasn't even big enough to have a patch of grass separating it from the road. There was about enough room on the grassy bank before turning into woods to roll out the air mattress and so that's what I did. It was 1:30, I knew I wasn't going to get much sleep and it wasn't going to rain so I didn't bother with the tarp. I rolled out the air mattress, tossed down the sleeping bag and hoped that I didn't roll around too much - rolling one way and I'd be on the paved part of the layby, roll the other way and I'd be rolling into stinging nettles. I took my kit bags off the panier rack, which is something I did every night to try and give the bike a break from bearing all the weight, except this night I piled the bag at the end of the air mattress where my head would be to try and block the headlights from traffic. Nothing I could do about headlights from the other direction or all the noise, but I had to try something at least! So, there I was, just outside of Okehampton about 1:30 in the morning and only 130 miles lay between me and Land's End. About 5:30 the next morning and my prediction came true - I woke up with not too much sleep. But, I was up with plenty of time on the last day of the cycle to finish it! As I peeped my head over my bags I noticed a car just pulling into the layby. 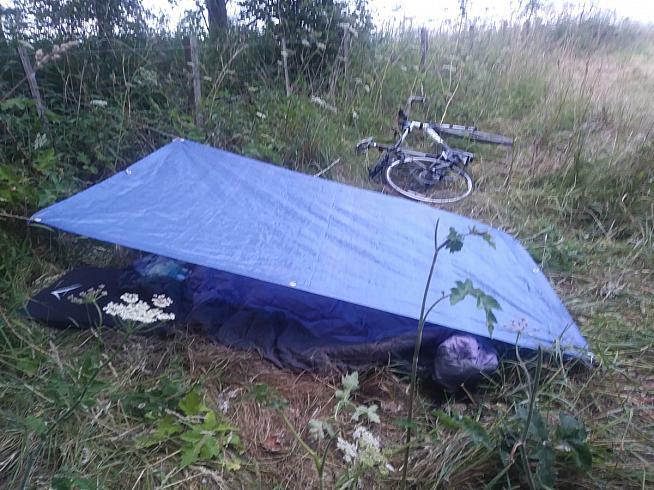 Maybe they didn't really need to stop, or maybe they wondered if there wasn't a better layby to stop in where there wasn't some weirdo clearly sleeping in the ditch, but they hadn't even finished their rolling stop before they were heading out of the layby again. I packed everything up, treated myself with another breakfast of beans and tuna and hit the road for about 6:30 with 130 miles to cover before completing my JOGLE adventure. Initially, I rolled along, but the tiredness and lack of sleep quickly caught up with me. About 10:00 I rolled into a layby and noticed a food truck selling tea and food, but they wouldn't open for another hour. The layby was quiet, so I sat down at a picnic table, lay my head on the table and caught an hour's well needed sleep. When I woke up I thought I was a part of a zoo - there were quite a few families and other cars pulled in the layby suspiciously eyeing me! But, importantly, the food truck had its steel shutter rolled up and was opening up for the day's service. Asking the question I knew was only going to bring disappointment, they did not take card. The lady told me in a friendly voice that I could find a cash point at the top of the hill a mile down the road. Hopping back on the bike off I went in search of a cup of tea I could pay for with card. What that friendly lady in the food truck didn't tell me was that the cash point at the top of the hill a mile down the road was attached to a service station that also had a Subway on site! I didn't need to turn around cycle down the hill for a mile to get a cup of tea, I could get one - along with a better second breakfast - at the Subway! All stories of Cornwall are true. It is beautiful, the A30 is busy and it is hilly. Very hilly. For a chunk of the day I cycled up one very long hill only to hit the top with a sign saying there was a 10% descent coming up. I'd freewheel down, hitting 30-35 mph no problems and at the bottom was right back into climbing the next very long hill. At the top of each hill I could look south and see all the other hills yet to be climbed! Should tag this day using the well-used Instagram hashtag #MondayMotivation! On the bike rolled past signs and through places with names that I was familiar with after looking over the logistics so many times during the planning. Then the A30 narrowed from a dual carriageway to a two lane road, and yet, on it went. Someone from Surfers Against Sewage (the charity I was raising money for) had suggested coming to meet me at the very end in Land's End and was pinging me messages through the day to mark progress. The day was another hot one - not quite heatwave hot - but definitely hot nonetheless. The landscape is truly beautiful with reminders of Cornwall's history dotted everywhere in the form of old smokestacks once used in tin and copper mining. As I rolled along I had an epiphany: to get to Land's End I had to go through Penzance first, and my hostel was in Penzance. I could check in, have a cup of tea, drop off my bags and then cruise the final 10 miles to Land's End. A brilliant idea. I was again suffering by this point in time - tired, suffering from chaffing, I just wanted to be done. The newly formed plan gave me encouragement and on I rolled, finally seeing signs with Penzance and then Land's End on them. The numbers dropped with each sign, eventually dwindling to less than 10 miles to Penzance, then less than 5 miles. Just outside of Penzance and looking south from the road there was a beautiful view of the famous St Michael's Mount island amongst the wide, sparkling view of the sea. And then I was rolling into the Penzance's outskirts with the big Morrisons and Sainsbury's either side. I rolled along the sea front past the harbour and ferries bound for Scilly Isles, the newly refurbished lido damaged in the 2014 storms, and along the promenade drinking in everything. Taking a right on the promenade and cycling past the Cornish Pirates RC pitches I found my hostel - Penzance Backpackers. It was closed when I arrived with a sign saying for guests not to let anyone in. Kindly, one of the guests ignored that; I found the kitchen, made a cuppa and settled in to wait the 15 minutes or so before the manager was scheduled to come back and I could check in. Even though I wasn't finished my JOGLE adventure, it was nice to be sitting down. The manager arrived, I checked in with no troubles. While I broke down my kit, I had a tin of beans and tuna and another cuppa. With all the stuff I'd carried from one end of the country to the other end piled halfway up the wall in a heap I made ready for the final 10 miles from Penzance to Land's End. I hopped on a very much lighter bike and headed 10 miles south to Land's End. It's beautiful, with fantastic views of quaint countryside and the sea. Most of the ride out is spectacular although with all the signs, pubs and everything else telling you you're close to Land's End, you expect it to come up on you sooner than it does. About 3-5 miles out from Land's End I started hitting what I thought was the entrance to Land's End - so I started cycling faster out of excitement. Caning it down the road I still wasn't at the end a mile later... two miles later and now I was starting to flag! At last I was done. I arrived in Land's End about 8:00 pm, and accidently interrupted someone's conversation on the phone to be pointed towards the famous landmark sign for a photo. Looking to the south are a few rugged rocks poking through the sea and then the sea continuing on to the horizon. To the west, the coast path sits atop storm beaten cliffs with a quaint old cottage keeping vigil over the sea. To the east, more cliffs and the coastal path. A lady with her family offered to take my photo with myself and the bike posing in front of the landmark sign and that was it. From one end of the UK to the other, I had cycled it. Through wind, through rain, through the complaints coming from my body, through the sun and heat and over it all I had arrived almost 1,000 miles and 10 days later at the point where I could tick that goal off the list! I hopped back on the bike and cycled back to Penzance. In the final three days I managed to cover about 440 miles... Maybe that's why my bike started deteriorating. By the end of the cycle, two of the spokes in the back wheel had broken and the wheel itself started to buckle. I didn't have any food and didn't want to cook, so had a shower and went on a quick walk around Penzance to see what I could find and have a look about. I managed to find a kebab shop and while I waited I went off to find a pub for a celebratory pint. Pint finished and kebab in hand, I walked back to the hostel and ate in the kitchen almost falling asleep while eating! My phone was ceaselessly pinging with notifications from friends and family all congratulating me. With the final 130 miles cycled that day, and knowing that if I got on the bike the next day it would be a choice and it would only be a short spin, I carried my weary self off to bed. I'm finished now. The odd person has asked the question, 'Do I miss it' in a facetious tone, expecting me to say that I don't miss it. But, truth be told, I do. Yes, it's a lot of miles to do each day, fully exposed to unpredictable and uncontrollable weather. Yes, it's tiring and across the day you'll both love the cycle and wish you never saw your bike again and wish you'd never started in the first place. But, that's challenge. That's part of why I signed up in the first place. On top of that, it was my holiday and holidays are so much more simple than reality. I had three things to worry about daily - cycling, refuelling and sleeping, and I could address these as and when I wanted to or they needed attention. On top of the simplicity that cycling all day lends itself to there's also the absolute privilege of cycling in these areas - the things you see and experience. Across the three primary forms of transport (car, cycling and walking) cycling has to be the one that offers the most value. In a car, you can cover tremendous distances, but there's very little intimacy that comes with that. Everything is just a whoosh that passes by in the blur of a second. Walking provides extreme intimacy and great opportunity to learn a lot, but is incredibly slow. Cycling is the happy medium, where a cyclist can cover a great distance in a day and still gain a feeling and some understanding of what they've cycled through. Plus, pushing the boat out and cycling these trips brings you to new places! There was one commonality across all the places travelled this trip. It wasn't people, it wasn't that we were all in the UK, it wasn't anything obvious. It was something you'd notice going through town after town looking at the street signs. All roads point towards London regardless where you are! The north of Scotland has London Roads, Wales has London Roads, the south west also has... London Roads. As the Wikipedia page for London Road says, 'there are countless London Roads in the UK'. When I was staying in the hostel I found a book, 'The Unlikely Pilgrimmage of Harold Fry'. The main character, Harold, is a reluctant participant in life - he would much rather be left on the sidelines and retreats from his relationships. He ends up making this unlikely pilgrimage. At first he is scared, tired, hungry and sore. As he becomes accustomed to his walk he begins to enjoy it, he also begins to come out of his shell, engages with people he comes across and looks to listen to their stories. Through the miles he walks and the people he meets along the way, he begins to change his thinking and starts to think that people really are kind and where and when they can people, in general, will help. Mirroring Harold's own experiences, the world is full of good people who will simply offer an encouraging word to helping where they can. Strangers along my cycle gave me things in support. Friends and family all joined together as well donating money towards Surfers Against Sewage and, proudly, we all raised almost £1,000! Right, so enough of the philosophising on cycling's wonderments. Now that it's the summary - time to look at what went right and what went wrong. Obviously, the plan wasn't fully adhered to - I spent a night unplanned in a hotel, I really didn't care in the end about my £20 per day food budget (I ate what I wanted, when I wanted and didn't care about the price!) and I hadn't planned on hiring a car to get back from Penzance. Before I left, I had estimated the trip would cost around £845. After totting up the figures when back as best I could, I think it cost around £1100. Yes, certainly, I went over budget - by 30%. But, I hadn't accounted for a bike service in my original projection and that was almost £200. I do also need to get a bit of work done on the bike again - repair the back wheel and have the gears indexed again. But, given I didn't account for the service in my projections or the car hire, I was pretty close to budget. 1. Train with weight in mind: I was really happy I took the time to understand what cycling 100 plus miles in a day was like, and also did a few sessions of doing back-to-back 100+ milers. Where I went wrong and strained my Achilles was on the second of these runs. I did a dry run; across two days I cycled 250 miles through Kent with all the kit I planned on bringing. On the second day my Achilles started complaining. That dry run was too close to the actual start date to fully recover so I just pressed on hoping it would be alright. Building up both distance and weight carried would have been the sensible thing to do and will be what I do next time. 2. 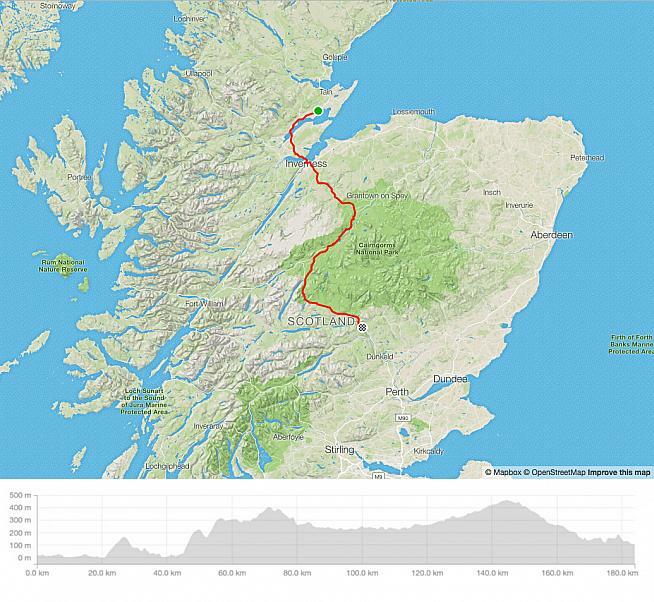 A more direct route overland: By day 4 I was ahead of schedule and would have been able to cycle more than the 60 miles I was limited to having reached the end of Scotland. I could have cycled JOGLE in less than 9 days. 3. Faff less and eat less junk: To cover the long days' distances would usually take me 12-14 hours, although rolling time was around 7 hours. Clearly, I faffed a lot and I felt like a lot of the day was consumed by being in the saddle. That's not a bad thing, but I stopped too often. A more focussed approach to the cycling would have given me more time to either plan stops and enjoy something natural/cultural, etc, or I could have cracked on and done more distance getting me farther, faster. But first, I'll take a few weeks off to recover from my holiday!